Even as the Trump administration claims to be taking control of the U.S. opioid epidemic, a new report says that fewer prescriptions are being written for addictive painkillers—and that may be due, in part, to hospitals and physicians being more aware of and willing to try alternative treatments. The study, Medicine Use and Spending in the U.S.: A Review of 2017 and Outlook to 2022, shows that prescription opioid volume had increased annually since 1992, peaking in 2011. Then a series of regulatory and legislative restrictions, combined with tighter clinical prescribing guidelines and greater reimbursement controls, resulted in declines averaging 4% per year from 2012 through 2016. These are medications that help temper cravings, although they may not completely stop addiction. So-called new patient starts are considered to be an important indicator of future opioid use if the usage is for chronic pain or if a patient becomes dependent on opioids. The IQVIA report also found that in 2017, 23.3 billion fewer morphine milligram equivalents (MME)—a measure used to describe the potency of an opioid—were dispensed to patients on a volume basis. This amounted to a 12% drop from the previous year and a decrease from 240 billion MMEs in 2011, according to IQVIA. Also, the report states that prescription opioid usage was about 22 pills, or 134 MMEs, per adult American in 1992 and rose to a peak of 72 pills or 1,011 MMEs in 2011. But usage has since declined to 52 pills, or 676 MMEs, per adult. What exactly does this data mean, and why are prescriptions decreasing? It appears the recent press given to the opioid epidemic, as well as the attention of government officials and policymakers, is beginning to affect medical practice. The White House declared the opioid crisis a public health emergency, and Congress is considering legislation that would address a mix of insurance coverage, payment issues, prescription regulations for Medicaid beneficiaries, and prevention strategies. Two years ago, the Centers for Disease Control and Prevention (CDC) issued prescribing guidelines that focused on chronic pain except for cancer and end-of-life care. The guidelines are targeted at primary care physicians in particular because family doctors write the vast majority of prescriptions for painkillers. According to Patrice Harris, MD, AMA president-elect and chair of the AMA Opioid Task Force, the decrease undoubtedly reflects physicians’ commitment to best practice when it comes to prescribing. However, Harris points out that decreasing prescriptions without increasing comprehensive pain care simply replaces one opioid for another. She mentions a recent CDC report indicating that opioid-related deaths continue to climb from synthetic opioids such as heroin and fentanyl. “We continue to work with the administration and Congress in support of patient-focused efforts to reduce opioid-related harms and enhance access to treatment,” she says. Those efforts are sorely needed, says Rebecca Parker, MD, senior vice president of advocacy and leadership for Envision Physician Services. She is a board-certified emergency medicine physician practicing in the Chicago area. There’s reason for optimism, however. “Through this combination of public health initiatives, coupled with a better understanding of the effects and risks of opioids and research showing the efficacy of non-opioid medications and alternative treatments to opioids, physicians and other clinicians have been able to decrease opioid prescriptions,” says Parker. 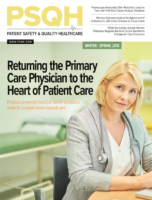 “Physicians and their patients are able to work together, along with legislators and policymakers, to deliver the highest quality of care and minimize opioid use. ER doctors tend to be on the front lines of the opioid crisis, as they usually are the ones to receive people coming to the hospital in search of pain medications. They also often see the most acute cases that require immediate treatment. Parker agrees. “Emergency physicians serve as the safety net to the healthcare system,” she says. “We see all patients, regardless of age, disease state, or ability to pay. Although they make up only 4% of the physician workforce, emergency physicians see the entire healthcare system and disease states. How can hospitals step up their game in helping prevent opioid dependence? Reports claim that “medication therapies” for opioid dependence have doubled every month. What are some examples of these therapies, and why have they not been used more in the past? According to Harris, doctors looking to ramp down their own opioid prescriptions have to look to other alternatives, but they also must find ways to get hospital administrators to institute a systemwide program. Of course, evidence-based care and treatment forms the foundation of medical training, but doctors also face challenges from insurance companies when prescribing treatments. “When non-opioid alternatives, ranging from physical or behavioral therapy to lidocaine patches and other non-opioid pharmaceuticals, are denied by health insurance companies or pharmacy benefit management companies, patients and physicians have fewer options,” Harris says, adding that a comprehensive plan begins with getting all staff involved, not just doctors. Specialists, Parker says, play an integral role in caring for patients and educating them about the risks of opioid addiction. “Physicians in several of our specialties, including algiatry, surgical, emergency medicine, and women’s and children’s services, are on the front line of the epidemic,” she adds. For example, the use of prescription opioids and illicit drugs among pregnant women has risen dramatically in recent years. Also, in the surgical realm, multimodal opioid-sparing analgesics and regional blocks have been proven to reduce postoperative opioid administration, especially in complicated trauma patients, she says. Hospitalists help manage pain in the inpatient setting and identify patients at risk for addiction to facilitate follow-up with appropriate treatment centers. They also play an important role in patient education about acute versus chronic pain and the appropriate treatment modalities, which includes the risk of opioid addiction.